Two series of Pd–MeOx/Al2O3 (Me = Co, La, Ce) catalysts were prepared and tested in reaction of methane combustion. The first series comprises the samples obtained by impregnation of γ-Al2O3 with the corresponding salts of La and Ce and additionally modified with Co. For the second series the LaCeAl2O3 SG and LaAl2O3 SG supports were prepared by the sol–gel method and the cobalt was not included as a modifying element. The aim was to obtain catalysts with comparable activities to that of the Co-containing samples, however the using of cobalt being subject of exclusion due to its high toxicity. 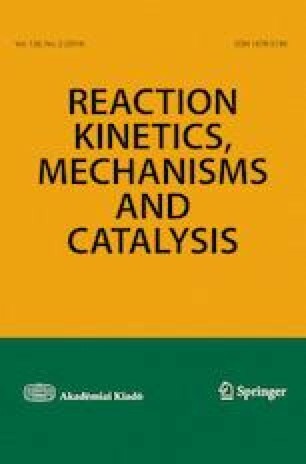 The catalysts were characterized by X-ray diffraction, X-ray photoelectron spectroscopy, Temperature programmed reduction and Fourier transform infrared spectroscopy. The modification of alumina with lanthanum and cerium by impregnation, before the cobalt introduction, decreases interaction between the PdO and the support leading to the easy transformation of PdO into the less active Pd, when the catalyst is treated at high temperatures. The cobalt-free samples prepared by sol–gel method exhibit activity and stability comparable with those of the impregnated cobalt containing Pd + Co/LaAl2O3 catalyst. The observed high activity is explained by the formation of stable PdO particles, however the needed Pd-content to achieve the same activity as Co-containing samples is remarkably higher. The authors express their gratitude to the National Science Fund of Bulgaria for the financial support under the Contract DFNI/Russia 01/1. A. V. Larin thanks the Russian Foundation of Basic Researches within the Grant 17-53-18026-Bolg_a.